Apple has sued a third-party MacBook power adapter manufacturer and alleged it has violated patented designs, and also, in a separate trial, appealed to move its ongoing defense against clone iPod maker Luxpro to a California court. The suit against Media Solutions Holdings, filed Monday in a federal district court in California, also names as defendants eRepalcements and Laptops For Less. It states that both Media Solutions and eRepalcements use the brand Laptops For Less to offer goods and services, through which they provide a power adapter for Apple's MacBook that is claimed to infringe on Apple's patents. "Through various websites and otherwise, the Defendants market these knock-off power adapters for use with Apple portable computers, such as the MacBook. The Defendants' infringing conduct has damaged Apple and inflicted irreparable harm." U.S. Patent No. D478,310, entitled "Power Adapter," was issued on Aug. 12, 2003. It covers an ornamental design for a power adapter. 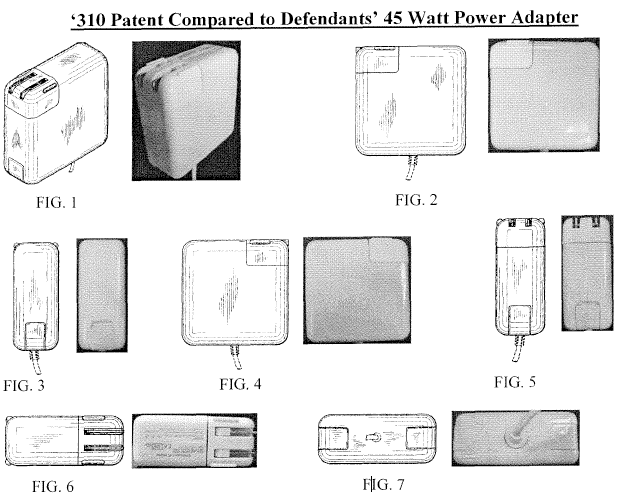 The suit includes photos of the 45-watt power adapter from Media Solutions, and compares them to the design shown in Apple's patent. The adapter in question, the suit says, "is substantially the same as Apple's patented design." Another image shows the official Apple power adapter and the third-party product side-by-side. Both look identical, with the exception being the third-party product does not include the Apple logo. Apple has requested that the court award damages to Apple in compensation for the alleged patent infringement, and place an injunction against the defendants to prevent them from continuing the sale of such products. It requests a trial by jury. In the last week, Apple also made a new filing in its ongoing dispute with knock-off iPod and accessory maker Luxpro. The company defended itself successfully against Apple years ago, and returned fire by seeking $100 million in damages from Apple over a product similar to an iPod shuffle. The most recent filing requests that the court vacate a Sept. 28, 2009, decision that denied Apple's motion to transfer the case from Arkansas to California. Apple believes the move is fair because the defendant does not reside in the western district of Arkansas and has no connections to it. "The northern district of California has a substantial connection to the dispute and is more convenient for both parties and for a substantial number of nonparty witnesses," the request reads. "The denial of Apple's transfer motion was a clear abuse of discretion." The Luxpro suit was filed in Texarkana, Ark., in October of 2008. It accuses Apple of trying to unlawfully interfere with Luxpro's business and attempting to hold a monopoly over the world media player market.